Firstly, R-rated fuses are not capable of providing long-term protection against overloads, which is the main reason they don’t hold an ampere rating. Any current that falls between the minimum and maximum interruption rating will elicit the fuse to operate, with the former rating undergoing verification during UL testing. R-rated fuses don’t operate independently and are applied in combination with a contactor and overload relay. In order to guarantee reliable operation, the time-current characteristics of the fuse and the overload relay must be matched so that the contactor breaks the connections below the fuse’s minimum rating. This improves the workable lifespan of the fuse, as otherwise it would need frequent replacement that would lower its economic efficiency. A medium voltage starter is designed in an application-specific manner, which is why R-rated fuses are provided as part of the package. Unless stated otherwise, deviations from these ratings should be avoided. If the end-application already has a starter then the starter manufacturer must be consulted for selection of optimum R-rating, which may result in recalibration of overload relays or fuses. The US-based company Mersen has an array of protection devices as part of its portfolio. With respect to medium voltage protection, it offers 5.08kV, 7.2kV and 15.5kV bolt-in fuses, acting as current-limiting devices for short circuit protection. 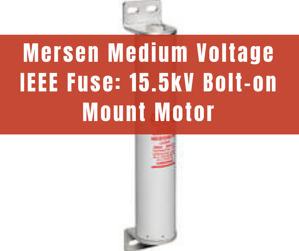 Most common applications for these fuses are medium voltage motors and motor controllers. The fuses feature single, double, triple or quadruple barrels with 3 inches diameter along with end mounts for direct bolting operation.